Posted on 19/11/2014 by Laurent Moeri	in Conversations, Education, Hearts & Minds and tagged Anarchism, Nigeria, Sam Mbah. AntiNote: This is a full transcript of an interview with Sam Mbah, recorded in March 2012 in Enugu Nigeria by Jeremy of the Jura Books Collective – an anarchist collective based in Sydney Australia. Sam Mbah, author of “African Anarchism”, a lawyer, activist and journalist passed away on November 6 2014, after complications arising from his heart condition. The world is worse without him. Many comrades and activists around the globe will be saddened to hear of this loss. Our thoughts are with Sam’s family and friends. We send our sympathy and condolences. Jeremy: It’s been about 15 years since the publication of your book on the prospects of anarchism in Africa. What is there, if anything, that comes to mind that you would add to or change about the book, and the ideas that you presented in it? Sam: Yeah, I want to look at the ideas that I would add, not really change. Ever since the publication of the book I have been collecting additional materials that I stumble upon in the course of my writings and research. I think there is room for additions to the book, not really much to change, or subtract from the work. I think there is room for additions to the book, and this is something I have already started in the sense that in the Spanish edition that came out in 2000, I wrote an extensive foreword, wherein I tried to articulate some of the points we missed in the original book. I tried to look at more African societies that shared the same characteristics and features as the Igbo, the Tiv, the Efik, the Tallensi and the multiplicity of tribes and social groups that we have in Nigeria that I have already mentioned in the book. I also tried to explore other groups in other parts of the world especially Latin America, and I was able to draw some parallels between their social existence and systems of social organization, and the characteristics and features of anarchism, as I understand it. J: For those of us who haven’t read the book recently, can you just recap a couple of things about what anarchism means to you and how is it connected to some of the intrinsic aspects of African culture? S: I pointed out in the book right away that anarchism as an ideology, as a corpus of ideology, and as a social movement, is removed to Africa. That was a point I made very explicitly at the outset of the book. But anarchism as a form of social organization, as a basis of organizing societies – that is not remote to us. It is an integral part of our existence as a people. I referred to the communal system of social organization that existed and still exists in different parts of Africa, where people live their lives within communities and saw themselves as integral parts of communities, and which contributed immensely to the survival of their communities as a unit. I pointed to aspects of solidarity, aspects of social cohesion and harmony that existed in so many communal societies in Africa and tried to draw linkages with the precepts of anarchism, including mutual aid, including autonomous development of small units, and a system that is not based on a monetization of the means and forces of production in society. So, I look back and I feel, like I pointed out earlier, these are things that if we carry on additional research it would throw more light on how these societies were able to survive. But again, with the advent of colonialism and the incorporation African economies and societies into the global capitalist orbit, some of these things changed. We’ve started having a rich class, we’ve started having a class of political rulers who lord it over and above every other person. We’ve started having a society that is highly militarized where the the State and those who control the State share the monopoly of instruments of violence and are keen to deploy it against the ordinary people. That’s their business. J: In the last few years we’ve definitely seen an increase in authoritarian rule in many parts of the world, and austerity measures, in the wake of the September 11th terrorist attacks in the States and the global financial crisis, more recently. How do you see those issues, and how have they affected Africa, and the struggle here? S: When I wrote African Anarchism with my friend, we wrote against the backdrop of nearly four decades of military rule in Nigeria. Military rule was a form of government that believed in over-centralization of powers, and dictatorship, as it were, and it was a strand that evolved from capitalism. So while the Nigerian society and much of Africa was under the grip of military rule and military authoritarianism, today we have a nominal civilian administration, a nominal civilian democracy. Some people have called it rule democracy, some people have called it dysfunctional democracy, all kinds of names, seeking to capture the fact that this is far from democracy. And for me it is an extension of military rule. This is actually a phase of military rule. Because if you look at democracy in Nigeria, and the rest of Africa, those who are shaping the course and future of these democracies are predominantly ex-military rulers, and their apologists and collaborators within the civilian class. So, looking at the global stage, capitalism is in crisis. At any rate, capitalism cannot exist really without crisis. Crisis is the health of capitalism. This crisis is what many philosophers, from Marx to Hegel to Lenin to Kropotkin to Emma Goldman, and more currently Noam Chomsky have spoken extensively about: the tendency for crisis on the part of capitalism. So, between the coming of ‘African Anarchism’ and today, we have seen 9/11, the so-called ‘war on terror’, the financial crisis of 2007-2008, today we’re faced with a major global economic crisis that is reminiscent of the great depression of the 1930s. And there is no absolute guarantee that, even if the global economy emerges from this crisis, it will not relapse into another, because the tendency towards crisis is an integral part of capitalism. For us, here, these historical developments have had a serious impact on our society, our economy, our government. If we begin from the 9/11 incident, today the world is under the grip of terror and counter-terrorism as well. Here in Nigeria in the past one year, the country has commonly experienced bombings, explosives, we are seeing everyday increasingly everyday there is a bomb set off in one place. And how does the Nigerian State react? It reacts with more force, and in the process of using more force it creates collateral damages and casualties all over the place. So we are not immune from the ravages of terrorism and the ‘war on terrorism’ which the West embarked upon, after 9/11. Our country is well under the grip of terror. And it is ironical that any moment there is a bomb that explodes somewhere, the government shouts, ‘this is terrorism! this is terrorism!’ But the hard line tendencies of government and the agencies of the State which use undue force and undue violence in resolving issues that would otherwise have been resolved without any loss of life – these are glossed over and seen as being normal. But any moment a bomb is set off anywhere, the government counters that this is terrorism. I would say that government, the State, in Africa, is the greatest source of terror. The State in Africa is the greatest source of terrorism. I think that the society would be a lot better, the day the State ceases from acting and deploying its agencies as instruments of terror against the ordinary population, and the common people. So, the global economic crisis, the global capitalist crisis, has impacted negatively on African economies, including Nigeria – because we are part and parcel of the global capitalist system, albeit we are unequal partners in the global capitalist exchange. Our economy is dependent on commodities. Our economy is a mono-crop one. Anything that happens to oil is bound to have a crisis effect on us. And that is one of the reasons why you saw Nigerians and the Nigerian State in a stand-off at the beginning of this year , over phantom subsidies which the government said it wanted to remove, and which people protested. J: Could you explain a bit more about the fuel-tax subsidy for those who aren’t familiar with how it works in Nigeria? S: The fuel tax, or what the Nigerian government calls the ‘fuel subsidy’, assumes that the government is subsidizing the cost of fuel for the citizenry. That the Nigerian people are not paying a realistic value for fuel in the country. But the counter-argument is that we are an oil-producing country, and there is no reason why the cost of fuel should be based on the global or international market. We have refineries, we have about four refineries that collectively have a refining capacity of about 500,000 barrels per day. But you find that in the past twenty years these refineries have not functioned. They have not functioned because of corruption. They have not functioned because the powers that be in the country are not interested in these refineries functioning. The only reason why these refineries are not functioning is because there is corruption and a lot of people in government, in the military and in the bureaucracy, are benefitting from the wholesale importation of refined petroleum product. Nigeria is about the only OPEC country that imports 100% of its refined petroleum needs. S: The ordinary people in Nigeria were saying, if our refineries were working, and they refined our crude, the government should be able to say at what cost this crude, these products are refined. And based on the cost of refining you can now set a price. That insofar as you have not been able to make the refineries functional, and you are fixing the cost of petroleum products on the basis of what it is in the international markets, you are making a grave mistake. Because the cost of living in Nigeria is different from the cost of living in United States. So the government says, ‘We pay so much to the importers of petroleum products as subsidy’ – that means the difference between the cost of importation and the selling price of the refined product. But you find out that even those who have been in government, even ministers of petroleum products, came out to say that much of what you pay as subsidy is based on corrupt documentation, which the government does not investigate, which the government does not in any way try to clarify, which involves senior officials of the organs and agencies that are supposed to regulate the petroleum industry. They are the ones who are paying these huge sums to themselves and to their companies. Let me illustrate the concept of the oil subsidy by one reference. The Nigerian government allows a multiplicity of traders to bring in petroleum products. They buy refined petroleum products from a multiplicity of international traders, when in fact the Nigerian National Petroleum Corporation – the NPC – which is our national oil company, can enter into purchase agreements with refineries that exist abroad, and get these refined products directly from refineries. Instead, they prefer to go through middle men, who get the refined products from refineries, and sell them to NPC at exorbitant rates. At the beginning of the year the government wanted to supposedly deregulate the downstream sector of the oil industry. And labour and civil society groups protested, and resisted such a move. In the event, a two week strike was called. During those two weeks, the people stayed away from work, the people protested in the streets of Lagos, Kaduna, Port Harcourt, Kano, Ibadan, in different parts of the country. And because the government sensed the resolve of ordinary Nigerians to resist these arbitrary increases, the government backed down somewhat, by bringing down the over 100% increase in prices of petroleum products to about 30%. And of course the labor movement practically sold out, because the civil society and the mass of the population were prepared to go on with the protest and refuse the pay the 30% increase, but labor sold out, and that is where we are today. I would say, it is an unfinished struggle. My sense is that the government still intends to achieve its objective which is 100% increase in the price of petroleum products. But if there is anybody in government who is still thinking, who is still moved by any sense of objectivity, they would have seen that the resolve of Nigerians to resist these arbitrary increases based on false analysis of what subsidy constitutes, is something they cannot wish away. The people are also mobilizing. Just as the government is devising other strategies through which it will increase the price of petroleum through the back door, the people are reviewing the last encounter and trying to find out what other ways they can employ that advance their cause. J: In that massive and very inspiring mobilization, there were elements of reflection of some of the global movements we’ve seen recently, some part of the protest was called ‘Occupy Nigeria’. We’ve seen the explosion of the Occupy movement and the Arab Spring, what do you think of those? S: Yeah, yeah, the Occupy movement in parts of America and Europe has really inspired a lot of people in Nigeria. The resolve and the courage that has been demonstrated by the Occupy movement in different parts of America and European capitals, is a pointer to the endless possibilities that abound if people decide to struggle. The Arab Spring on its part, has been a most refreshing experience for those of us in Africa. Actually, I’ve had conversations with my friends and I try to point out the fact that the Arab Spring should have been happening in sub-Saharan Africa, rather than in the Arab world, in North Africa, because the abject conditions of living in Africa [are much worse than] the relatively advanced standards of living in most of the Arab countries and even our neighbors in North Africa. So the Arab spring should have been happening in sub-Saharan Africa. That is my sense. But why is it not happening? It is because we have not been able to turn our anger into resolve, we have not been able to build the requisite social consciousness, to be able to instigate and sustain such a struggle. But based on what happened in Nigeria recently, I have no doubt that people are beginning to draw lessons from what is happening in the Arab world. And asking themselves some searching questions – if it can happen in the Arab world, why not us? If people who are living in better social conditions can elect to fight, to struggle, to protest in the streets, for days and months on end, how about us who cannot even find light. Light in Nigeria is a luxury. Our economy is a generator-set economy. [The State electricity grid functions very poorly; the rich use private electricity generators.] You virtually provide your own water, you provide your own security. Nothing works here. Unlike if you were to go to Libya. I’ve not been, but I’ve read stories about Libya, Egypt, Tunisia. These are better organised societies, where social amenities and public utilities function. But here we are in sub-Saharan Africa where nothing works. So, I can say without any fear of contradiction that the protests in Nigeria in January, were an offshoot of the Occupy movement in America and Europe, as well as an offshoot of the Arab Spring. So, I don’t know whether our protests have gotten to the point where we can call it a ‘Nigerian Spring’, but I guess that the Nigerian Spring will still come. J: Sam, climate change is a major threat to Nigerians, as it is to everyone else on the planet. What are some of the specific environmental issues here, and what sort of consciousness is there of climate justice, and sustainable development? S: I’ll answer your question from two perspectives. Let me answer it with the general perspective and then I’ll come to the more personal perspective. The threat of climate change is real. We, in this part of the world, are not immune from the threats of climate change. If we take a look around us, the humidity levels are rising. In recent times, where I live (I live in a small bungalow of three rooms), if there is no light [no electricity, no fan], I can hardly sleep. My children can hardly sleep, except during the rainy season, it becomes a lot more manageable during the rainy season. Because what makes it even worse is that our light, our electricity situation, is in fits and pieces. I’ve found that in the past three or four years, between the months of March and April, before the rains start all over again, I am sweating like I have never sweated in all my life. I am seeing increasing levels of temperature that I did not see while I was growing up, and even in the 80s and 90s. Over the past five years, one has had to live with very sweltering temperatures. And the sources of this are not far-fetched. If you look around, the forests that used to exist… If I go to my village, there used to be very deep forests, where little children would even find it very difficult to enter. Today most of these forests are no more. The little trees and mini forests that exist are being logged on a daily basis, and there is no form of check on logging. If you go to the villages, logging is taking place at very ridiculous levels. There is no agency of government in this part of the country that is doing anything to regulate it, to curtail it, to minimize it. So trees are being cut as never before and nobody is doing anything to replace these trees. The forest cover is increasingly going down and in our own part of the country where the population density is probably the highest in Africa outside the Niger Delta, we find that human activity is impacting seriously and negatively on the environment. People are building uncontrollably, roads are being built, bushes are being burnt. There is deforestation on a massive scale. And one of the consequences of deforestation in our part of the country is erosion, of soil, gullies, even roads in some places have been cut in two. Then of course the streams and rivers and rivulets that used to contain a lot of aquatic life are today drying up. There’s a stream that lies about 200 metres from my country home in the village. When I was growing up I never saw it dry up. But in the past ten years, if the rains fail to fall between February, March, and April, times when the stream dries up. J: And how are people thinking about that, because people want to see development, but how can that be justified with sustainability? S: The ordinary people do not have an accurate consciousness of what is happening. They are blaming evil forces, unseen hands and all kinds of metaphysical objects for these happenings and these developments. And it is actually up to the government to educate the people about the negative consequences of deforestation, of unbalanced utilization of resources, about the benefits of a planned, sustainable development – both for the individual and for the society at large. But the government is not doing much in this area. There is actually a dearth of public enlightenment and conscientization on the principle issues. And you find also that in our villages, the lands that used to be fertile are not producing as much food, as much crops, as they used to. These are the consequences of climate change. Yes, at the level of the elite, of the enlightened few, there is a realization that yes, something is wrong. But at the level of ordinary people, there is no conscientization, no effort to enable them to understand that it is in their interests to ensure that they protect their environment. J: You mentioned the Niger Delta. That is one area in Nigeria where the struggle over environment and oil has been particularly acute, with massive oil spills but also militant activity which has had a real impact on oil production and trying to reclaim some of the wealth from oil for people. What are your views on the activities of militants in the Niger Delta? S: The activities of militants should not be viewed in isolation. The activities of militants is consequent upon the exploitative tendencies of oil companies operating in the Niger Delta, who are not adhering to international best practices that they continue to observe elsewhere around the world. In Nigeria, because they are complicit with the Nigerian state and the government, they carry on as they wish. They carry on as if tomorrow does not exist. They carry on because there is nobody to call them to order, to hold them to account. So the emergence of the militant groups in the Niger Delta is consequent upon the exploitative practices and tendencies, and the absolute lack of care for the environment in the exploration, drilling and production of most of the oil companies operating in the Niger Delta. If viewed against this background, the militant groups are responding to a clear and present threat to the existence of communities in the Niger Delta. When we were growing up, we grew up to learn that most of the villages, tribes and social groups in the Niger Delta were essentially fishermen. But with the constant oil spills, despoliation of the environment, the denudation of the fauna and the aquatic life of the Niger Delta, much of the fishing industry has disappeared. Much of the farming and agricultural activities taking place there have also disappeared. So, when you have robbed a people of their environment, how, in good conscience, do you expect them to survive? To continue to exist as a people. You see, our people have a saying that nature has placed at the disposal of every group a means of survival. I’ll give you an example. In the south-east, in Igboland for instance, our people survive mostly on our land. We survive on our palm trees, our people make palm oil, our people farm, this is the basic means of subsistence. If you go to the North, they do not have palm trees. They survive on other firms of agriculture, like planting onions, planting yams, and also pastoral existence. If you go to Niger Delta, the basic means of subsistence is fishing, and some forms of agriculture and farming too. So if we agree that nature has placed at the disposal of every group some forms of sustenance, we are witnessing a situation where the means of sustenance of much of the Niger Delta has been taken away. Through the activities of oil companies who are not minded on any form of corporate social responsibility. That is the context in which I view the militancy that sprung up in the Niger Delta from the late 1990s till today. Yes, most of the militant groups engage in all forms of criminality and banditry as well, which do not in any way serve the interests of ordinary Niger Deltans. And that is condemnable, but it does not in any way vitiate the original sin that pushed them into further sin. J: Yes. Speaking of sin, Nigeria is quite a religious society. Religion is very deeply ingrained here. And often it takes quite conservative, sometimes violent forms. What are your thoughts on religion in Nigeria and what it means for anarchism and organising more broadly? S: I’ll say that religion and religious practices have entered a new phase in Nigeria. Before the advent of colonialism, our people were mostly African religionists, who worship our small gods – gods of thunder, gods of river, and such other gods. With the coming of colonialism, the two main global religions – Islam and Christianity – became a predominant force in the lives of Nigerians. The rivalry and competition between the two religions has tended to play down the fact that not all Nigerians are Christians or Muslims. Even in the North-central, you are talking about pagan tribes and different forms of African religion that take place in those places. But today Nigeria is profiled and stereotyped as a Christian South and a Muslim North. Yet if you go to the North you find a lot of non-adherents to Islam, you come to the South as well you find a lot of non-adherents to Christianity. But I would say that in the past 20-30 years the singular influence of Christianity and Islam has been considerably negative on the society in the sense that both religions have become sources of manipulation, political manipulation of ordinary people. When you hear that there is a religious riot in the North, a religious riot in the East, when you go down and examine the issues, they are not basically religious. Politicians are using religion to manipulate the ordinary people into fighting for the political positions and beliefs of the elite. Religion has become an instrument of manipulation, exploitation, deceit, and large-scale blindfolding of ordinary people in Nigeria. It is one of the elements militating against social consciousness and the development of the working class, as a class, in Nigeria. The development of a class of the dispossessed, the oppressed, the marginalized, who feel and share common interests and are keen to fight for those common interests. Religion is thrown in as a wedge, as a source of conflict among ordinary people. Like Karl Marx said, religion becomes the opium of society. Every little thing is covered, is given a religious coloration, when it is actually not. It is a tremendous setback to the development of social consciousness in Nigeria and the rest of Africa as a whole. J: Yes. You’ve already touched on it, but those religious divisions are often related to (but not solely related to) ethnic divisions, and race, and gender as dividing people from each other. What are your thoughts about that? S: Well the problem we have is not really race as such, it is about religion, it is about ethnicity. Much of religion in Nigeria and Africa is geographical. You find that religion tends to conform to certain ethnic boundaries. When you hear about a Fulani, you imagine a Muslim. When you hear about an Igboman, you imagine a Catholic Christian. When you talk about the man from the middle belt of Nigeria, you’re talking about an evangelical Christian. So, much of our religious differences have become geographical in nature, in the sense that certain ethnic boundaries are coherent also with certain religions. The people have been made to see these differences as permanent features of life, not things you can overcome. The truth is that before the commodification of exchange and the means of sustenance in our society, before the monetization of the economy, people related with one another, and did not mind about religious differences. Everybody believed your religion ought to be a personal issue to you. But with the politicization of religion, the way we are seeing it today, social differences have been magnified by politicians, who use it to manipulate and control the mass of the population. J: And what about gender? Is there a change in the struggle for women’s liberation? S: The struggle for women’s liberation in Nigeria and the rest of Africa has come a long way. In the sense that, our society, which is patriarchal in nature, emphasises the role of the man. In many African societies, as I tried to point out in my book, the role of women is diminished, reduced to almost to footnotes. But the truth is that even in traditional African societies, if I use the tradtional Igbo society as an example, the role of the women is critical, is central to the creation of balance and social harmony. But most of the time it is underplayed. J: You’re talking about the role women play as leaders? S: Yes. You might not believe it, but let me tell you something – one of the less obvious manifestations of African society. In traditional African societies, in traditional Igbo society, for example, a woman who is unable to give birth for the husband, assuming the husband dies, and the woman is faced with the reality of not continuing the lineage at her own death, it was common for women who find themselves in this situation, to marry another woman. So when Africans say lesbianism, or women marrying women, or men marrying men, is not traditional to us, any clear-headed political analyst, anthropologist or sociologist in this part of the world, would know in Igbo society it was common for women to marry women, when faced with that situation in the absence of their husband, and be seen as the wife of the older woman. Maybe the older woman might also bring a man who sleeps with the younger woman and begins to raise offspring for the memory of the late husband. The traditional African society would not achieve balance and harmony without the role of the women. Their role was critical to the resolution of disputes. In Igbo resolution of land disputes, family disputes, and intractable social issues, the views of women, especially those who were seen as women who have made some achievement materially was continually sought by the men folk in traditional African societies. Moving away from traditional African society to the present day, education has been the critical force in the liberation of women. Women go to school, in Igboland today there are more women in school than men. Because the men go off to do business, trading activities. Increasingly, in many primary and secondary schools the number of female pupils outnumbers the males. Many families have realized that if you train women, you train a nation, if you train a man, in some cases, you are just training an individual. The importance of women in our society is continually being reasserted. The courts of law have played some role in trying to liberate women from being the underlings of society. In Igboland in the past, women could not inherit the estate of their fathers, even if they were the only children of their parents. There is now a court document that says a man can make a will and devolve his estate among his male and female children equally. In cases where the man did not have male issues, he can devolve his estate among his female children. So we’ve recognized some advance. There is virtually no course in university where you do not find some women folk – medicine, engineering, geology, computer science, not just the humanities and arts. Women are everywhere, even in the military. But I would say still, given the fact that our society is 50% male, 50% female, there is still a lot room for improvement for women. It is an ongoing struggle. It is not something that is likely going to end. The momentum we have achieved is such that the future looks very bright indeed for women’s liberation and gender equality in our society. J: Sam, you played a very important role in the ‘Awareness League’, which was a Nigerian anarchist organization that flourished in the 1990s. Can you tell us a bit about how it grew and how it declined? S: It’s a little nostalgic for me these days, talking about the Awareness League, because the Awareness League was a romantic idea. When we entered the universities in the early 80s, what we encountered was socialist groups, socialist teaching, Marxist teaching especially. And we became attracted to Marxism, in the sense that it preached the coming of a new dawn in society, and by extension, the African continent. We were really enthralled by the perspectives of Marxism, and the abiding, thorough critique of capitalism that Marx and Marxist literature embodied. It did not take much time before we defined ourselves as Marxists on campus, and this continued until we left the universities. When I was leaving university I wrote a thesis in my final year on the political economy of Nigeria’s external debt crisis then, and in the thesis, it might interest you to know, I employed the Marxist framework, as my tool of analysis. Where Marx was talking about the economy as providing the axis around which the further movement in society revolved, whether it was politics, or culture. I also talked about the tendency of capitalism towards crisis. These were ideas that enthralled us. Also the ideas of revolution. Marx said that the history of all hitherto existing societies has been the history of class struggle, and talked about the revolution being the midwife of a new society, giving birth to a new one. Usually in Nigeria, after your graduation from university, you are obliged to take part in a mandatory one year service. So I was posted to the old Oyo state with its capital at Ibadan, for the mandatory one year national service. It was there that I met a couple of socialist-minded young men like myself, and we started organising and talking about Marxism, socialism, leftist resistance. We identified ourselves essentially as a leftist organization. In the course of that, some of us started subscribing to ‘The Torch’ newspaper, published in New York. It was there we started gleaning for the first time, the initial ideas of anarchism. That was how, gradually, when we finished our national service, some of us who were living in the south-east, started thinking about an enduring platform. Because socialism even then was entering a serious crisis. The crisis of the Soviet empire was brewing. It was not long thereafter that communism collapsed in Europe. And it was in the midst of this crisis that we started increasingly vacilating towards anarchism. Subsequently, Awareness League was born, and the rest is history. The Awareness League first of all, derived its lifeblood from the resistance against military rule in Nigeria. The continuation of military rule acted as a spore. It was one of the inclusions that continued to give oxygen to our existence then as Awareness League. It is on record that between the late 1980s and the late 1990s, Nigeria witnessed the toughest anti-military struggle. Awareness League joined forces with other anti-military groups in resisting military rule in Nigeria. It was in the process of coming into touch with a lot of anarcho-syndicalist groups around the world, in Europe and America , that I and my friend decided to intellectualise the the subject of anarchism by producing a book, which you very well know. The struggle against military rule ended with the coming of civilian rule in 1999. I would say that the antagonism of not only the Awareness League but all the civil society, community-based groups, and leftist organizations in the country, virtually evaporated. Because the military was a uniting factor, I would say, in the sense that every person – whether you were anarchist, Marxist, leftist, socialist – saw in the military a common enemy to be resisted, to be opposed, to be overthrown if possible. With the coming of civilian government, we did not have that kind of common enemy any longer. Because some of the groups, some individuals from these groups, now started gravitating towards bourgeois politics. But let me say that for the most part, the problem was not individuals gravitating towards bourgeois politics, it was really that the civil society groups, the leftist groups and organizations, were not prepared for the consequences of [civilian] rule. We did not analyze in a serious sense what would be the consequences of the end of military rule and the coming of civilian rule, in the place of the military. We took it for granted that it would be business as usual. But as it happened, the end of military rule singularly signaled the end of most of these community-based, civil-society-based groups. Most of these groups, including the Awareness League, fragmented. By the dawn of the new millennium, we were just a few individuals left, trying to grapple with the reality of social existence and political developments in our country. Some of our members have had to go back to school, taking up teaching appointments at some universities, some are grappling with the realities of survival and existence in our kind of society. I personally have been having health challenges – it’s not something I want to broadcast – but I’ve been having some health challenges. Between 2007 and 2009, I had serious health challenges. For me, I find that it is impossible to recreate Awareness League in the circumstances that we find ourselves in today. So perhaps, I said to myself, we cannot recreate Awareness League, but we must maintain some form of interaction among ourselves, we must continue to interact with others in civil society. We must continue to engage, even with those in power, in some form of call to account. And we must devise more realistic ways of being relevant in society and trying to make a difference in our respective communities and in society at large. So I have since then, gone into trying to join hands with some people in trying to create a non-governmental organisation known as Tropical Watch. Concerned essentially with issues of sustainable development and environment, including climate change. In the process also we have been drawn into some anti-corruption fights, anti-corruption struggles in our society. Because we find that one of the greatest threats to sustainable development is corruption. Corruption makes it impossible for resources to be allocated in a judicial, transparent manner. Such that all sectors of the economy, all sectors of the society, would benefit. It is corruption that makes it impossible for governments to check uncontrolled logging in different communities for instance. It is corruption that makes it impossible for contacts awarded for road construction, for provision of water, for sanitation and things like that to be exhibited. In so far as corruption exists, it is impossible to create a harmonious balance between resource utilization and the existence of our environment and societies. So these are some of the things that I personally, in conjunction with some other friends and like-minded individuals, have been trying to create. But it has not been easy. Because, like I told you, what happened to Awareness League is not unique – it happened to every single other civil society group, every other organic social organization in the country that took part in the anti-military struggle. I’ll give you another example, one of the largest NGOs in Nigeria over the past 15-20 years, has been the Civil Liberties Organisation. It was a body dedicated to fighting for human rights, constitutional rule, and fighting against police violence and all forms of violence against civilians. The Civil Liberties Organisation (CLO) grew in leaps and bounds so that they had offices in all different parts of Nigeria. But I can tell you: in the past seven or eight years, the CLO has almost been dead. Actually, what we are seeing is more or less a ghost, because there is no state in Nigeria where their office is functional any longer. 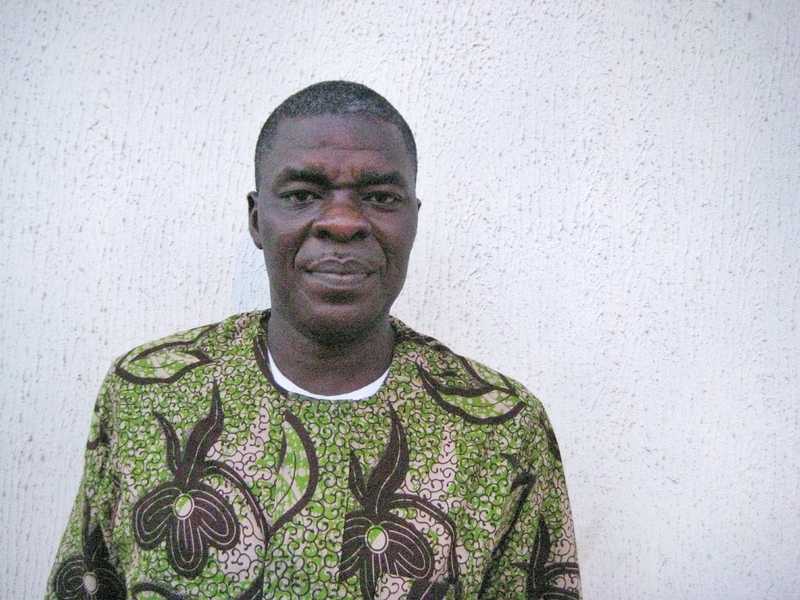 The man who used to be the zonal director here in Enugu has virtually been left to fend for himself. They haven’t paid the rent on their office in the past five years. So what I’m trying to say is that what happened to Awareness League is what happened most other organizations. Even Tropical Watch is still trying to find its feet. J: What about working-class organizations in Nigeria, trade unions, to what extent can they be reclaimed as vehicles for working-class struggle? S: The trade unions in Nigeria were particularly active in the early anti-colonial struggle. I told you some time ago about the struggles of the coal miners here in Enugu – Enugu was the coal mining capital of Nigeria. During the anti-colonial struggle for independence, the colonial masters killed about 49 coal miners here in this city, who were struggling against the exploitative tendencies of the managers of the mines. It was a landmark development during the anti-colonial struggle in this part of Nigeria. I told you about the city of Jos, where you had a flourishing tin mining industry, the workers were well-organized. The mining industries became a pedestal for unionizing in the country, including the regular civil service. At the turn of independence, we had a fairly sizable working-class trade-unionism taking place in the country, and this continued until the advent of military rule. Military rule stultified the development of trade unionism in the country. They were able to do this by invoking primordial sentiments, religion, tribalism and issues of regionalism as well, to divide and rule, to manipulate workers. Depending on which government was in power. The trade union movement in Nigeria – towards the dying days of military rule – tried to regain its voice, started calling major national strikes, started organizing on a national scale. But I can tell you that the fortunes of trade unionism has been hampered by the deindustrialization process that has continued taking place in the country, since the dying days of military rule. Most industries have folded up. One of the largest employers of labor in this country used to be the textile industry. It is no more. The textile industry has been wiped away completely. We now depend for our textile materials on cheap textile materials coming from China, neighboring countries, India. The textile industry used to employ more than 200,000 workers across the country. The automobile industry used to have assembly plants – here in Enugu Anammco, Peugeot was in Kaduna, Peleot was in Bauchi, Volkswagen was in Lagos. All these assembly plants have closed down. We used to have a trident steel sector in a number of places. They’ve all closed shop. So there has been massive deindustrialization in the country in the past 20 years, and it has affected the fortunes of workers. So the core of the workers we have today are either in the civil service, the banking sector, or the petroleum industry. The workers in the petroleum sector see themselves as being favored souls. So they hardly take part in their union activities, except the junior staff. The same thing also in the banking industry, in fact one of the codes of practice was that you don’t take part in union organising. For upwards of 10-20 years the workers accepted it. But since the first failure of banks in Nigeria, which took place in the late 1990s, the junior workers in the banks are beginning to organise again. But they’re no longer as effective. So basically, what you have as unions in Nigeria, are basically the civil servants. And you will agree with me that the industrial experience is based in industrial workplaces, not in offices. Not in air-conditioned offices and white-collar tables. So the state of union activities today in Nigeria is deplorable. And most union leaders see their positions from the point of view of their career. They think of their career first and foremost, before anything else. It is one of the key factors that affected the last nation-wide protests, in the sense that the leadership of the Nigerian Labour Congress capitulated at the last minute. Let me also point out that the professional groups in Nigeria – the medical doctors, the bar association, the architects society, the society of engineers and similar professional groups are not minded on working-class organising and development. They start from the perspective of seeing themselves as being privileged members of society. Even though the circumstances of a significant proportion of their members is the same as that of ordinary Nigerians. For them there is no incentive to begin to organize. Instead what a person is trying to do among the professional groups is trying to see how he can use the system to advance his personal or group interests. J: Sam, I wanted to ask, what are some of the things that the people who are active – the rank and file activists in unions, or people like yourself in Tropical Watch or civil society organizations – what are some of the things that people do to try and build the struggle? Like practical day-to-day tasks, what do people spend their time doing to try to build up social struggle? S: We, the activists, try to meet. We try to hold workshops. There are some workshops that we hold or are sponsored by donor agencies, that bring together activists. We have had seminars and workshops in the areas of police brutality, police violence, gender violence, climate change, you know. These seminars and workshops in a way try to bring together activists of all persuasions. And from time to time, arising from social, economic and political developments around us, we try to set up meetings among groups and individuals, and see if we can work out areas of agreement and see if we can build up on that. But I must be fair to you, especially here in the south-east, we have not been able to build a virile civil society in this part of the country. The people in Lagos have been able to create better models essentially because they have greater experience in this field, arising from the years of military rule. The people in Abuja are doing well as well, because since the movement of the seat of government to Abuja, we have witnessed the concentration of activists organising to hold the government accountable in one way or another. But we have not been so lucky here. I guess that part of the problem is that most people are concerned with the struggle for everyday survival. But I reckon that this is not enough of an excuse to give for not being able to organize. The experience of one of our comrades Osmond Ugwu who, not too long ago, has been a victim of state high-handedness. He came out to organise workers, to protest against non-implementation of the minimum wage. The minimum wage was a national policy of the PDP government, and a national minimum wage act was passed by both chambers of the national assembly. All the states in the country were now obliged to implement the minimum wage, to bring it into practice in their respective states. But the governor here in Enugu refused to implement it. Or decided that he was going to delay the terms of implementation. And when Osmond and one or two of his comrades tried to organise the workers, to sensitize them on resisting this harassment by the government, he was incarcerated. It is instructive to note that while Osmond was trying to mobilize the workers, the leadership of the Nigerian Labour Congress here was collaborating with the state government and negotiating away the rights of workers to organize. Ultimately he paid the price by being sent to jail and being tried on trumped up charges. It was not until the the later part of January this year  that he was released. Based essentially on the protests mounted by Amnesty International. And today he still faces a criminal charge which is as ridiculous as anything can be. This underlines the threats faced by those who struggle to create a new society in our kind of environment. J: One last question Sam: how do you conceptualize global solidarity? I mean, how best can activists in so-called ‘developed’ countries support activists in the majority world, and vice versa? S: Yeah, the activism in the developed world can do a lot really to stir up the consciousness of people here. But I guess that at the end of the day, the people here must take responsibility for our lives, must take responsibility for resisting autocratic governments, must take responsibility for seeking to hold them accountable as well. People in the metropolitan world can assist us by trying to help us build capacity. You see, the civil society groups here are not quite at home with the tools of modern communication – the social media – which has played a very important role in the Occupy movement in different parts of Europe and America, and in the Arab Spring. 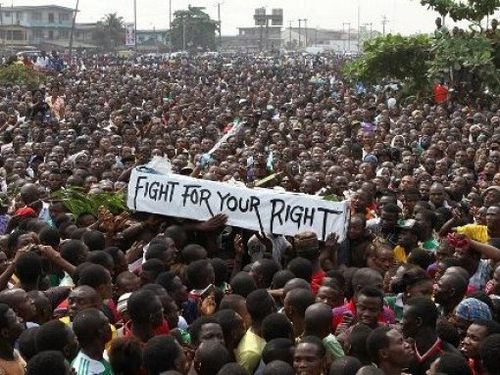 You’d be surprised that the Nigerian protest was not significantly boosted by social media. Yes, there were instances when social media came into play, but our notion of social media here is going to your email box and replying to email or going to your own Facebook. That is the notion of the average Nigerian about social media. But [it is more difficult to learn] how we can utilize twitter or YouTube, to upload pictures and things, how do I create a blog that is easily accessible to other activists who have access to the net? It is true of course that the Internet access here is still developing. By my own reckoning, is still under 20% of the population. Or much less than that. Yes, people have some Internet access when it comes to going to their email box, replying to messages, sending messages, maybe Facebook. But if you’re talking of social struggle and the net, the Internet access rate is less than 10%. So people from the metropolitan world can really help us by trying to create capacity in the tools for social media communication. That is very critical if we must make progress in organising and even in building solidarity with the outside world. If we have access to these tools, it becomes much easier to keep in touch with the rest of the world, and for the rest of the world to know exactly the true situation of what is happening here. People should be able to, from their respective areas, not just the urban areas, to be able to take pictures and upload on the net and try to make as much capital out of them as possible. J: Is there anything else you wanted to add before we wrap up? S: Yeah, I want to say a few words to our anarchist friends and groups that in the past associated with us, supported us, in one way or another, especially from Europe and North America. I say to them that anarchism is not dead in Africa. But it is important for them to appreciate that anarchism as a movement, as a political movement, as an ideological platform, is still going to take some time to crystallize here. But in the mean time, we must continue to engage with the rest of the society. We must continue to interrogate the government in debates where we can achieve. That is what informed some of us going into non-governmental organizations. When you talk to people about about anarchism in this part of the world they are like, ‘Well? What is it about? Ah, no no no anarchism is about disorder, chaos, confusion.’ Of course when you do the intellectual analysis of social organization and how this [incorrect understanding of anarchism] conforms to anarchist principles [of how ideology controls people], you can make sense of it. It is difficult in this part of the world to begin to build a movement based on anarchist principles alone. But we can build a movement based on trying to hold the government accountable, trying to fight for the environment, trying to fight for gender equality, trying to fight for human rights. Because these are minimum principles on which a broad swathe of the population agree, and it makes sense for us to continue to interact and interrogate social existence and public policy on this basis. And seek to ensure that civil society is not extinguished completely. While also those of us who genuinely believe in anarchism will continue to organise and develop tools of organisation that will some day lead to the emergence of an anarchist movement.